#LetsTalkHemp Products - In the Dunn family we’ve always incorporated wholesome hemp products in our plant based diet for decades already. On a daily basis we sprinkle hemp seeds on pretty much anything you can imagine; nice-cream, salad, oatmeal, rice and even on the pasta. We make hemp milk lattes in the morning and bake hemp-almond-flour cookies and muffins in the afternoons. Hemp in all its forms (seed, oil, flour) is a Superfood so you can be creative with it. Lately, there’s been a lot of hype about CBD hemp extracts and it has become such a jungle with many competing brands that all vary in quality and effectiveness. I can’t tell you how many ordinary CBD samples I have received left and right that will stay in their little sample bottles... probably for good. So, talk about celestial timing when my Master Herbalist friend Leslie shared her finest 100% organic plant medicine in the form of CBD topicals and therapeutic tinctures with me to try... The same moment I also happened to have a fresh tattoo to heal (that was just hours old). Enerhealth Botanicals (and their tincuture line Helix Herbs) is a company with deep roots in ancient Herbalism, which aligns perfectly with my core beliefs, so what a perfect moment to put her products and my green philosophy to the test. What I also like about this company is that they use a process called Spagyric, which combines modern technology with ancient alchemical traditions. This produces a raw, whole plant living extract and makes this CBD cream vibrantly green, light and fresh. 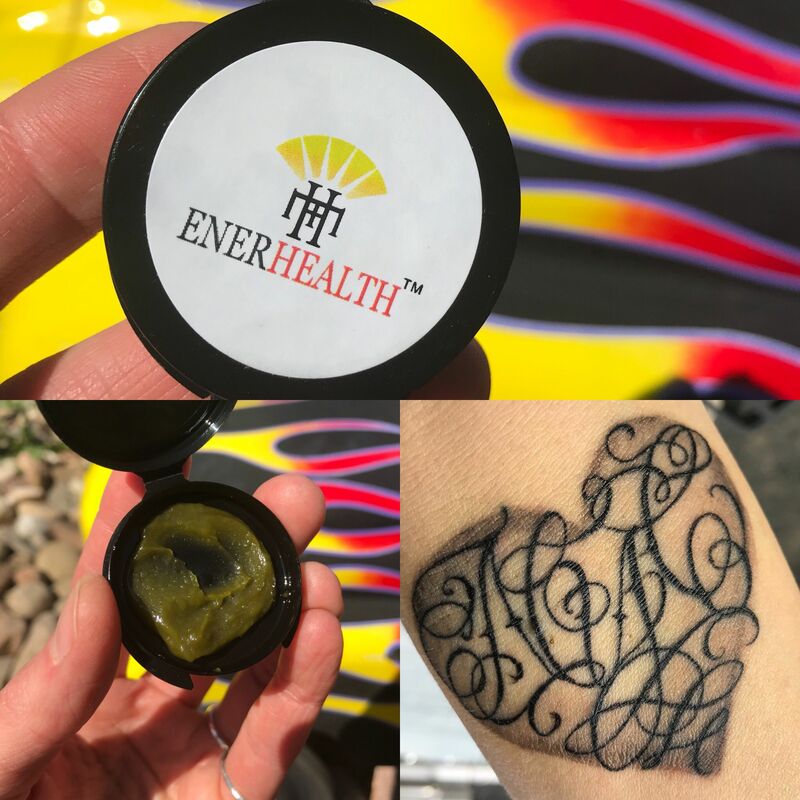 The Spagyric CBD salve that I used on my new tattoo for the first 3 days and on, is composed by pure plant ingredients including organically grown Hemp Extract, Coconut Oil, Calendula and Aloe Vera and Lavender. All cruelty-free ingredients with recognized healing properties for the skin. In addition I also tried their 500mg CBD tincture as extra healing support and to decrease any inflammation (they have them all the way up to 3000mg CBD). Hands down, I don’t think I’ve ever had a tattoo heal this fast. This photo is from 24 hours of healing (no filter!). I would definitely recommend anyone to add Enerhealth and Helix Herbs to their medicine cabinet. This is real medicine the way nature intended it.